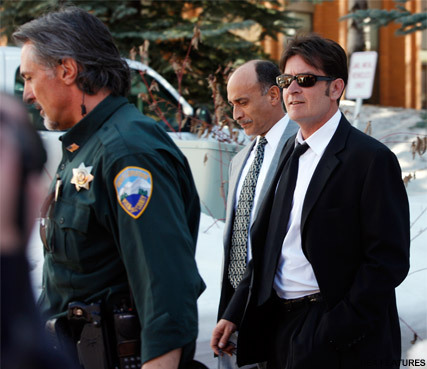 The latest in a long line of dramatic events, Los Angeles police last night raided the home of disgraced Two and a Half Men star Charlie Sheen, reportedly searching for drugs and firearms. It’s thought they could have forced entry to the property after the reportedly unhinged TV star broke a restraining order, issued by his ex-wife after his erratic behaviour last week. It’s thought officers took away bullets and a gun, but no arrests were made. As events unfolded, Sheen tried to play the police intervention down, telling fans the officers had arrived to ‘protect’ him. ‘All good here on homefront. All reports are false. I’ll explain more very soon,’ he wrote on Twitter, in response to reports he had been sectioned on an involuntary 5150 psychiatric hold. The American TV’ star’s bizarre – and reportedly drug-fuelled – behaviour has spiralled out of control in recent weeks, with a series of dramatic events leaving staff and friends increasingly worried for his health. 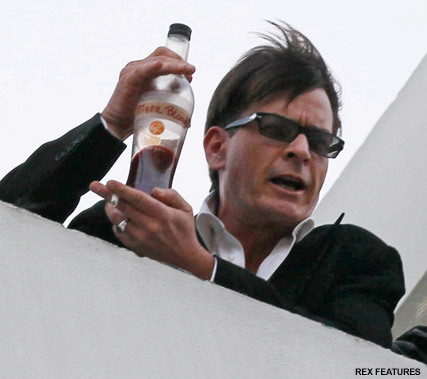 After being sacked from hit show Two and a Half Men, he was pictured on top of an LA building drinking ‘tiger blood’ and waving a machete, and has since made a series of rambling broadcasts from an internet channel titled ‘Sheen’s Korner’, branding himself and ‘warlock’ and ‘winner’. Now the unhinged actor – once the highest paid actor on US TV – has given a new interview, admitting he is in desperate need of help. ‘I’m really starting to lose my mind. I’m ready to call anyone to help,’ he told American Magazine Life & Style, adding he has been struggling to keep his life in order since his ex-wife was granted temporary custody of his children. And yesterday friends admitted: ‘Charlie is a ticking time bomb, and we all fear he could do something drastic like committing suicide or falling back on hard drugs. Do you think it’s time Charlie Sheen finally got help? Let us know in the comments box below.